You set your exchange rate, and we'll do the rest. Wouldn't it be great to know that you could place currency trades in advance, safe in the knowledge that they will only be completed if rates hit the level you desire within your preferred timeframe? FX Order Watch lets you set your own preferred exchange rate between two currencies – for example US Dollars and Euro. First you tell your Relationship Manager the currencies you want to exchange and the rate at which you want to trade, as well as the term over which you want the deal to happen. Note: The example below, including the indicative exchange rates & FX Commission, are for illustrative purposes only. You place two orders at the same time. 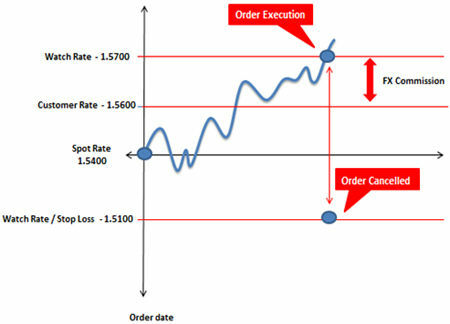 Whichever target is hit first, that trade is executed and the other order is automatically cancelled. If neither target is hit by the end of the term the order expires. Once we take your order, we monitor the currency market 24 hours a day, and will only make the trade when the market rate hits your agreed level. FX Order Watch is a valuable service for many of our global clients, especially those who already operate in a range of currencies. It is particularly beneficial for experienced foreign currency traders, because it allows you to decide the exchange rate you want to trade at within an agreed period of time. Also, if you have a specific view about which way you think currency markets will move, you can take advantage of this potentially occurring. Or if you simply want to diversify your assets across currencies, FX Order Watch could be ideal. Our dedicated Treasury Sales Officers are members of your Relationship Services Team, who will support you with updates on foreign exchange markets and Citi foreign exchange forecasts. Because currency markets fluctuate, there is always a risk with any FX product that you could lose some of your capital if you make a trade and then decide to immediately switch back to your original currency. For this reason, our FX solutions, including FX Order Watch, are best suited to experienced investors, those who already operate in more than one currency, or those who are prepared to accept the risk that currencies can fluctuate. Before you start placing your orders, you need to ensure that you hold the respective currency accounts which are adequately funded. You can also get in touch with your designated Relationship Manager who will be glad to provide you more information. This is a Non-Advised product. Citibank, N.A., UAE does not offer any recommendation for specific transaction with currency pairs, tenors and exchange rates (all 3 combined). Before you can place an order you must hold cash accounts with us in the original currency and the alternate currency. In addition, your cash account in the original currency must hold sufficient funds to cover the transaction amount. All orders are subject to a minimum transaction amount of USD 10,000 (or currency equivalent). When you place an order, we will place a hold over the transaction amount in the original currency until the order is executed, cancelled or has expired. This means that the transaction amount will not be available to you during the tenor of the order. All orders will be subject to a commission payable by you to Citi. This commission will be disclosed by Citi to you prior to the placement of an order. You may specify any watch rate for an order, subject to a minimum ‘cushion’ of 30 Price Interest Points - PIPS (meaning that the watch rate specified must be a minimum percentage above or below the current market rate at the time the order is placed). If you subsequently change the watch rate for an order, the new watch rate you specify will also be subject to this cushion (calculated against the market rate at that time). The size of the cushion may vary from time to time depending on currencies selected and market volatility. If you wish to change or cancel an order prior to execution you can do so. Orders will remain live until you have received confirmation that the order has been cancelled. Orders may not be cancelled or changed once executed. When an order is executed, the transaction amount will be credited to your cash account in the alternate currency. This normally happens immediately, but in any event no later than the second business day after execution. It is not possible to roll transactions over or otherwise place a new order using the transaction amount without having first received the transaction amount into your cash account. Please note, it is not possible to enter forward transactions (where the execution price is pre-determined regardless of market movements) using the FX Order Watch service. 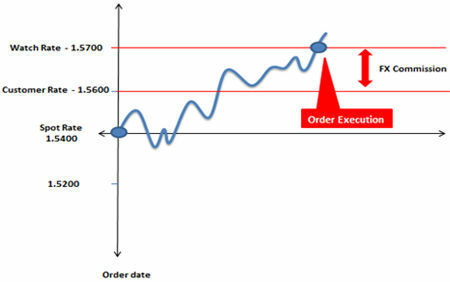 All orders are executed at spot (that is at the price available in the market at the time the transaction is executed). Please bear in mind that when the exchange rate to convert a foreign currency to your original base currency fluctuates due to market conditions, there is a risk of loss of principal due to an exchange rate loss. The amount you receive at maturity, when its value is calculated in your original base currency, may be lower than the principle you originally deposited. 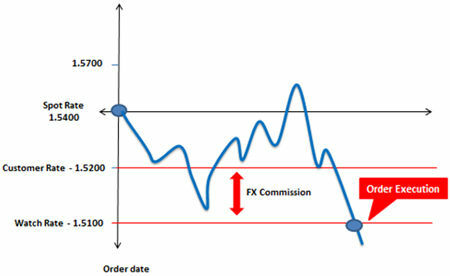 Regardless of the condition of foreign exchange rate fluctuations, there is a risk of loss of principle because the customer rate applied for converting a foreign currency back into your base currency includes Citi’s foreign exchange commission. Once the order is matched or executed, the product cannot be cancelled and the funds placed are not available for further transactions or withdrawal until the order is executed, cancelled or expired. Occasionally, for reasons outside our control, it may not be possible to execute an order when the market rate reaches the watch rate during the tenor. These reasons include but are not limited to market volatility or the liquidity of a particular currency may mean that the order cannot be matched in the market at the watch rate selected by you. We shall not be held liable for any loss, cost or claim arising out of or in relation to such circumstances. The order will remain live until the expiry of the tenor.